Artemis Guitars is very dedicated to providing our customers with the best quality guitar that is possible, but if something goes wrong one of our products you are in good hands. With every purchase of an Artemis Guitar product comes a lifetime warranty. 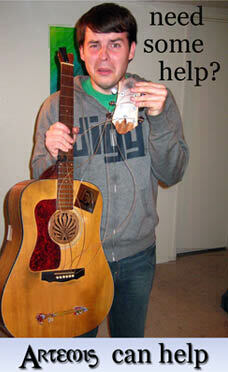 This means that we will fix or replace your Artemis Guitar free of charge and quickly. If the guitar has suffered damage that is beyond repair then we will recycle the existing materials and send you a new guitar within a few weeks. Artemis Guitars also provides a free online service to any basic questions or concern that a customer could have about Artemis Guitars. We offer a multitude of features on are support site that range from a professionally monitored forum for quick and reliable help to any question to our basic guides to how to care and protect your Artemis Guitar. The support site is available for anyone who has purchased an Artemis Guitar and has made a personal account for the site. These measures help allow Artemis Guitars to provide outstading customer service. We strive to keep our customers happy and playing our instruments.